Consider your craving satisfied and energy restored with AlpineAire Snack Mix. 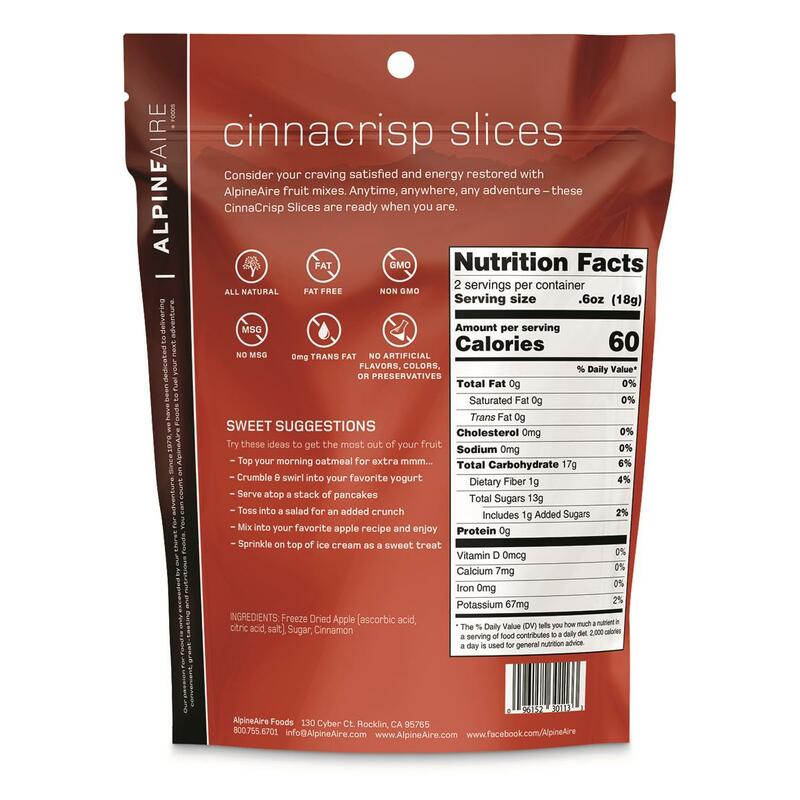 Anytime, anywhere, and on any adventure, this CinnaCrisp Snack is ready when you are. Tantalize your taste buds with Freeze-dried apple wedges sprinkled with a dusting of cinnamon and sugar. All-natural ingredients provide on-the go fuel for your high-performance lifestyle. Since 1979, AlpineAire has been dedicated to using only the finest, freshest all-natural ingredients to deliver convenient, great tasting, nutritious meals to sustain you on your adventures. AlpineAire Foods don't contain additives like coloring, flavoring or preservatives, so you know exactly what you're eating. AlpineAire is part of the Katadyn Group, the trusted name in water purification and filtration products. Freeze Dried Apple (ascorbic acid, citric acid, salt), Sugar, Cinnamon. 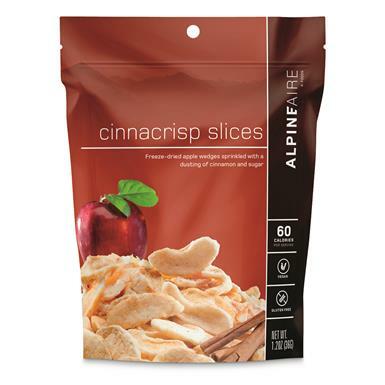 AlpineAire Foods CinnaCrisp Slices is rated 5.0 out of 5 by 1. Rated 5 out of 5 by Ash2018 from Very yummy snack but only 2 serving Love the taste and a great snack however your discription is wrong. This is only 2 servings and 120 total calories total.